This is the first solo exhibition dedicated to the work of Antonin Artaud to be staged in the UK, and more significantly to focus on the rarely seen notebooks which Artaud began working on from the time of his arrival at the Rodez mental asylum in 1945, until his death at the Ivry clinic in 1948. The eventual 20,000 pages of image-text amalgam constitute one of his most significant bodies of work. An unclassifiable volume of writing and drawing. Portraits, names, calculations, glossolalia, sigils, lists of drugs and foods stuffs, formulae, totems, lexicons, anatomies, objects, (boxes, chains and nails), machines and implements of obscure purpose. There are numerous fragments, blanks and extended texts whose occasional resemblance to poetry is incidental to another more occluded but violent operation, and where frequently there is enacted a puncturing of the surface with the tip of the pencil, and a repetitive gesture which gives the page “an anthracitic gleam”. Artaud was subjected to repeated sessions of electro shock treatment during his time at Rodez, (1945-46) and the books are inscribed with the trace of this experience, sometimes taking the form of incantations and exorcisms, devices designed to turn this incarceration against itself, to project a sovereignty in the face of institutionalised and occult violence, and to fashion a new body according to his own reimagined anatomy, a hardened and insubordinate form. Artaud insisted on the singular status of the notebooks. They were not perceived as marginal but as a new substance, and an action where the written-object-matter was worked onto and into the page. They are also the progenitors of a number of important texts of this period which emerged as autonomous publications (Suppôts et Supplications, Van Gogh Le Suicidé de la Société, and Artaud Le Mômo) where the process coalesces around a focus which the workings have given rise to. 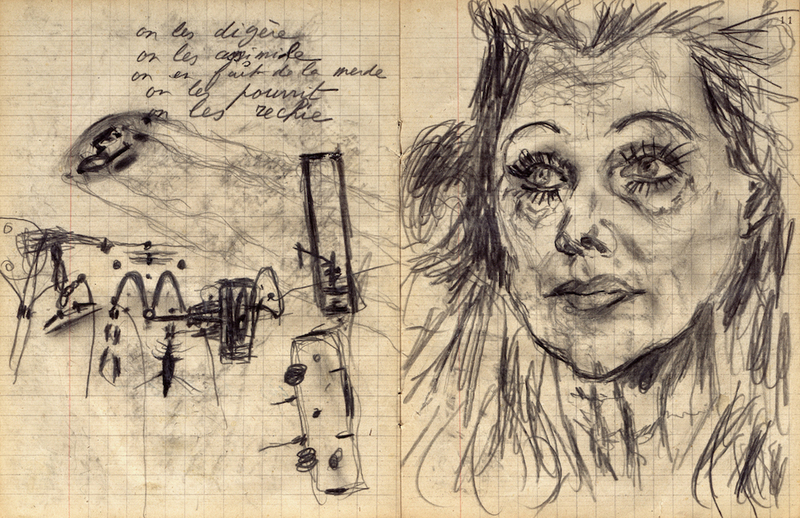 The notebooks, along with the majority of his drawings, were entrusted by Artaud to his close friend, devotee and eventual editor Paule Thévenin. When Paule Thévenin died in 1993 they were bequeathed to the Bibliothèque nationale de France. It is with the collaboration of the BNF that this exhibition has been made possible. In addition to the notebooks (of which 80 will be on display) the exhibition will include further drawings, photographs, manuscripts and transcribed extracts and translations. Additional pieces by, amongst others, Richard Hawkins, Henrik Olesen and Jean-Luc Parant will also be included. Many thanks to Guillaume Fau, Catherine Petit and Paul Buck. it was first a machine which at the same time has breath. and one that no human tongue integrates. I am it seems a writer. Without subject, verb attribute or complement. In my turn I teach them a manner of new behaviour. at the lumestin of the utrin cadastre. heavenly bodies of a too superb destiny.